This workshop, hosted by IFEDD (International Federation of Eating Disorder Dietitians) will introduce the philosophy of Ayurveda, India’s ancient holistic medicine system and sister science to yoga. Anastasia will lead you through the principles of the Doshas and how these basic Ayurvedic principles can guide Nutrition therapy. This workshop is designed for professionals interested in learning about Ayurveda and how to incorporate it into treatment. Please feel free to wear comfortable clothing as part of the workshop will involve joyful movement! Water bottles and some light "power snacks" will be provided. This workshop will introduce the philosophy of Ayurveda, India’s ancient holistic medicine system and sister science to yoga. Through the principles of the Doshas, you will gain an understanding of your individual constitution and how to integrate food, spices, breath, music and movement into your daily life. We will focus on healing practices specific to Fall that keep us grounded, nourished, and balanced. Please bring a journal and clothes for yoga and meditation practice. This workshop is designed for anyone either in recovery from eating issues or for professionals interested in learning about Ayurveda and how to incorporate it into treatment. Location: Laughing Lotus Yoga Center, 636 Avenue of the Americas, 3rd floor (at 19th St). Pre-registration is required, please contact healwithanastasia@gmail.com with any questions. Click here to purchase your spot today via PayPal. go beyond the physical body in helping us understand ourselves in a deeper way. Meditation is a vital way for us to stay calm and connected amidst life’s inevitable chaos. In this monthly workshop you will use the sacred tools of breath, mantra, or mudra to befriend your mind and find stillness in any moment. Whether you’re absolutely new or have been meditating for years, workshop open to all yogis! This 3 Week Series is for men and women who are working on healing their relationship to food and/or in recovery from disordered eating. This group is unique in that it offers a holistic approach to recovery, allowing the participant to connect to body, mind, and soul through yoga therapy and meditation, a nourishing meal, and post-meal process group. The yoga class is offered through the lens of Phoenix Rising Yoga Therapy, which offers tools that can allow for a more internal and personal experience of connection. What is your current relationship to your body? What would you like your relationship to your body to be? In this clinician-led workshop, we will practice making peace with our bodies through mindful movement, eating, and self-care. We will begin with a gentle asana class to ignite our connection to our bodies, practice a simple meditation technique for managing difficult emotions and sensations, and leave ample time for exploration and discussion of myths vs. science around eating, body size, and health to build a nourishing dialogue about body image and self-acceptance. This workship will be held on a private roof deck in SoHo. Anastasia is a Nutrition Therapist and Yoga Instructor who specializes in the relationship between body, food, and eating. She is the owner of Anastasia Health LLC. Anastasia works to incorporate mindfulness, movement and body awareness with food behaviors, guiding clients to learn how to appreciate their bodies. Lauren Ezell, LMSW, RYT is a Psychotherapist and Body Positive Yoga Instructor with a passion for helping people to live peacefully in their bodies. She created her company InBodied Yoga™ because she saw the need in New York City for a safe space for bodies of all ages, stages, shapes, colors, genders, and sizes to heal, learn, and explore the practices of yoga, self awareness, body- acceptance, stress management, and self-care. Lauren specializes in eating disorder treatment at an outpatient clinic in Brooklyn and maintains a private yoga practice in her Manhattan home with specializations in Restorative Yoga, stress management, alignment therapy, and yoga for eating disorders. This program is specifically designed for people diagnosed with MS, within the last three years, to provide an overview of the disease and through a panel of experts answer the many questions and concerns that typically accompany an MS diagnosis. Participants will have an opportunity to connect with people who are also recently diagnosed and meet the committed professionals affiliated with the New York City – Southern New York Chapter of the National MS Society who are helping people living with MS address challenges and move their lives forward. This session, led by Anastasia Nevin MS, RDN, RYT andElissa Holzman, Health Coach, Health/E, LLC, will explore the various tools to manage stress. We will take a closer look at yogic breathing practices, meditation and movement to connect body, mind and spirit. This 6-week group provides a mindful approach to eating in a supportive therapeutic environment ideal for individuals struggling with eating disorders, disordered eating, and body image issues. This group a yoga and meditation practice, pre and post-meal processing and dinner. This workshop will introduce the philosophy of Ayurveda, India’s ancient holistic medicine system and sister science to yoga. Through the principles of the Doshas, you will gain an understanding of your constitution and how to integrate food, spices, breath, music and movement into your daily routine and in recovery. We will focus on healing practices specific to this time of year that keep us grounded and in balance during the colder months and holiday season. Please bring a journal and clothes to move in! What is your current relationship to your body? What would you like your relationship to your body to be? 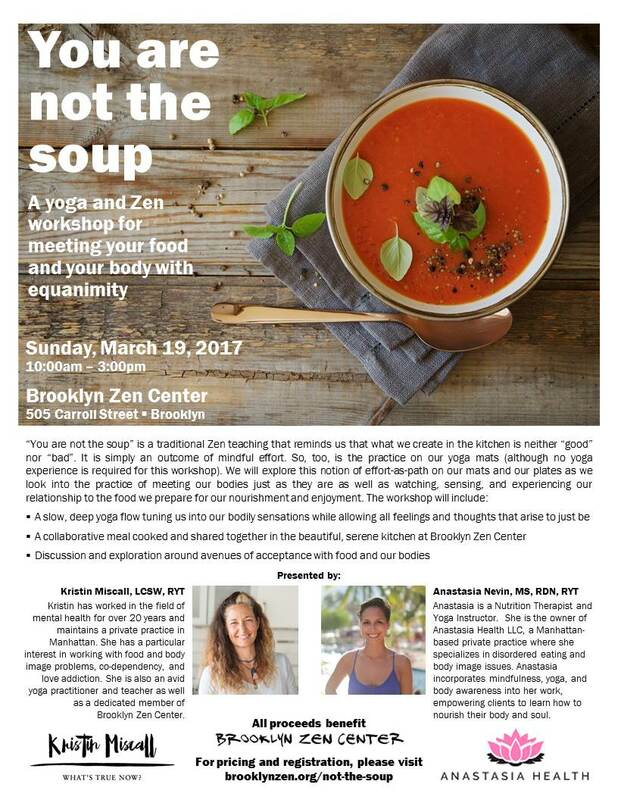 In this three week workshop, we will open up the dialogue around body image, nutrition and self-love through a yogic lens. We will dive right into exploring our Soul self through a yoga therapy movement practice to tap into the wisdom of our body. We will look at the science of nutrition to gain a better understanding of the needs of our physical body. Over the course of the three weeks, we will also focus on the psychological aspects of eating and nourishment, food and diet myths, and what feeds us. The series will culminate in sharing a nourishing meal, to connect to and celebrate our Satsang. The Divine Feminine has is a timeless, universal energy that has been defined through the ages as: Yin, Shakti, Sophia, Shekhinah, Rhahim, The Great Mother, has been named: Isis, Kali, Kuan Yin, The Virgin Mary, and Mary Magdalene to name a few and has been symbolized by the Moon, Spirals, The Turtle and The Otter. Join Us For an 8 Week Journey Through the Chakras as we invite the aspects of safety, creation, power, love, self-expression, intuition and wisdom into RECOVERY. Group co-facilitated by Maria Sorbara Mora, MS, R.D., PRYT, RYT & Anastasia Nevin, MS, R.D, RYT.